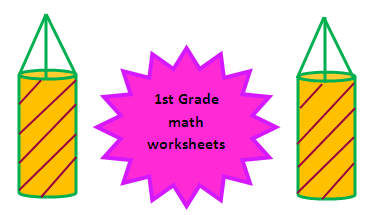 In this page 1st grade math worksheets you can find more than 10 worksheets in the first grade.Like this you can find more than 10 worksheets in each category. In this age 4 to 6 years children are introduced to numbers and some shapes.Numbers are initialization in counting.To improve interest in any subject children need some initial encouragement. Because this gives a pleasure to them and we can easily involve them to the subject.we need to appreciate the students.This will give positive approach to the child any thing and the child will become ready to face that.Everything is about attitude. Even the parents are weak in the subject math the parents should not tell to their child that "I am weak in the subject math". Because this will give negative approach in math.To improve counting to the children we have to show the different things to them and ask the to count. For example if we have any flower plant in our home,we can ask the children to count the number of flowers in that plant.We should not given pressure to them.Recognizing numbers are also important in this age.To develop this we can show cereal pack to the children and ask them to find how many ounces it is. Initially we should give pressure to the children they must tell the answer on time.we have to give some extra time to them and we should compare them with other child.Because this will not give interest in learning that subject.By considering these points we have prepared these 1st grade worksheets to improve interest on the subject math.This will be very useful to the kindergarten students.These worksheets will give more fun in learning. Here you can find some quiz papers in the topic 1st grade math worksheets.